One of our happy customers sent this in to us and we wanted to share his success. Late summer to early fall is the best time to spot seed and over seed your lawn. 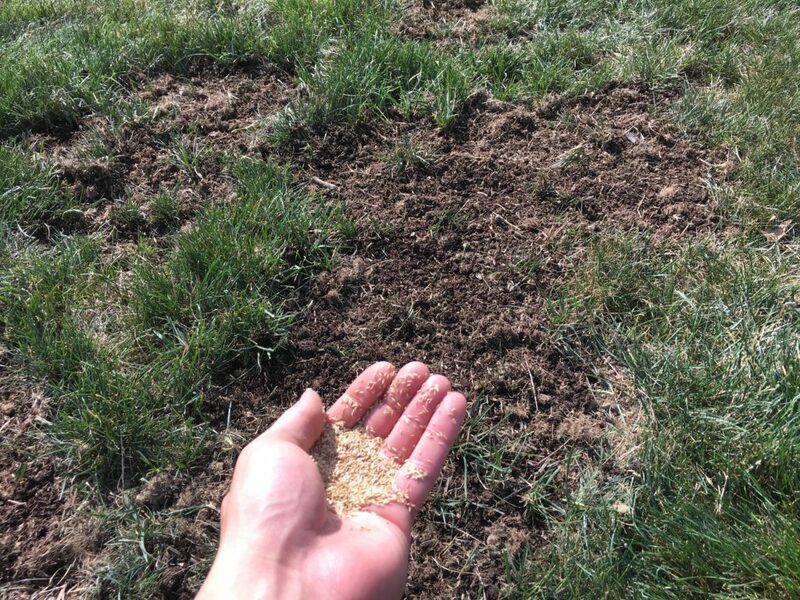 Seeding in the spring leaves turf susceptible to weeds, as grass seed and weed preventer cannot be applied at the same time. Seeding in the summer is an uphill battle, fighting summer heat and drought. Cool temperatures and morning dew of the fall keep newly planted seedlings moist, giving them the best chance at success. 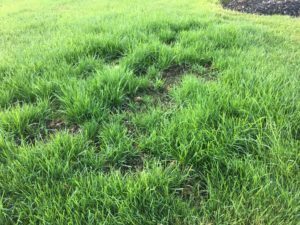 As your established turf begins to go dormant, this will free up much needed nutrients for your new grass to take root just in time for winter. 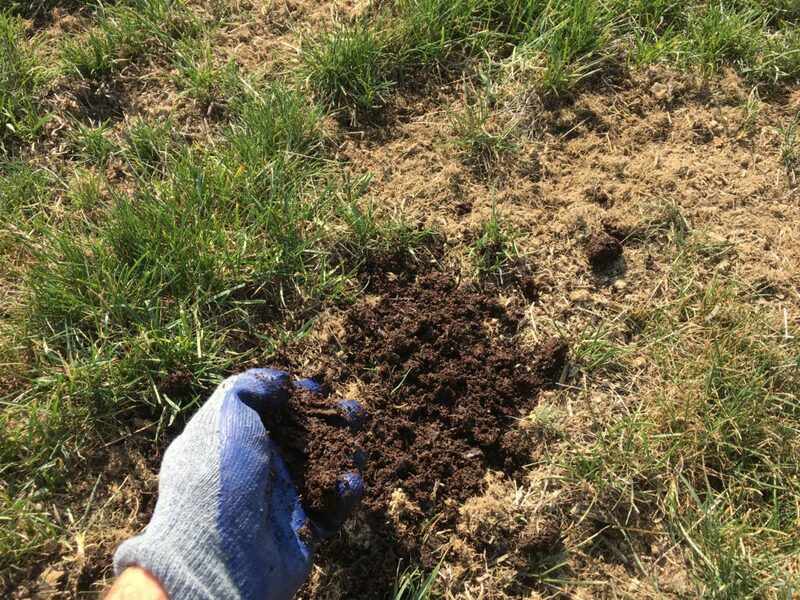 Dethatch and till the existing soil to a depth of 1-2 inches with a hand rake. If spot seeding larger areas, consider using a tiller to speed up this process. Add Sweet Peet to your freshly tilled soil and mix until the area takes on a medium brown color. 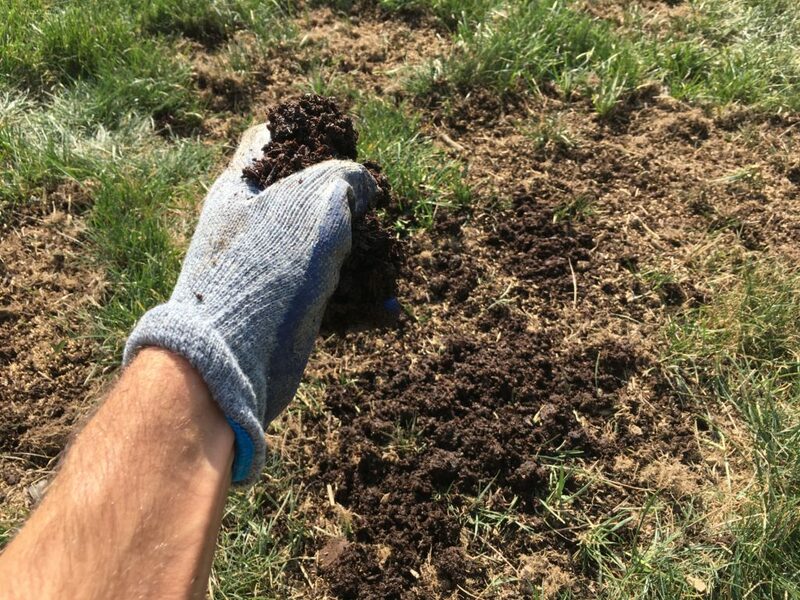 Thanks to Sweet Peet’s neutral PH level, there should be no need for additional amendments as a neutral PH of 7 is ideal for growing grass in this Midwest climate. 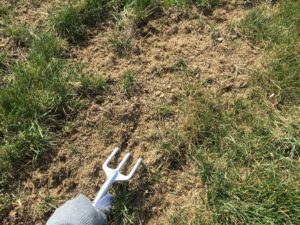 Roughly grade the area with a hard rake until the area is level so that there are no high or low spots in your lawn. Once the soil is properly amended with Sweet Peet, spread the seed liberally with your hand. 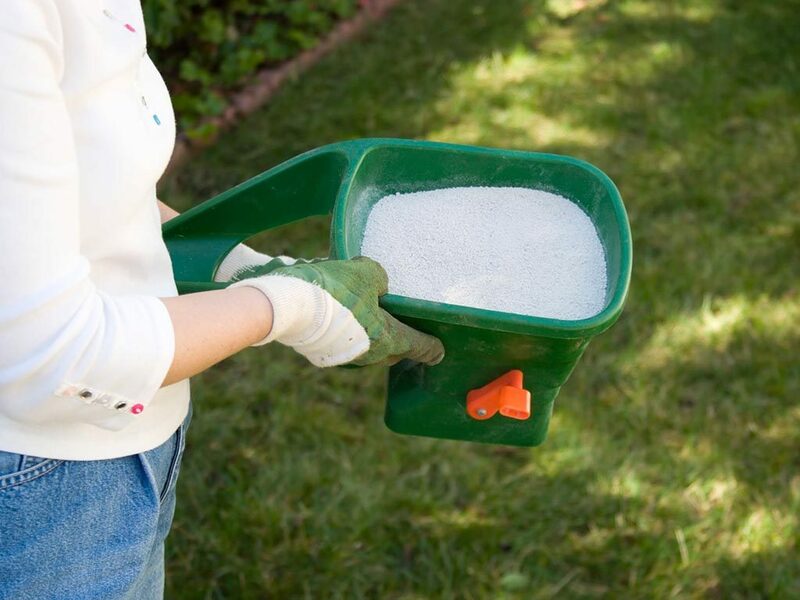 Use a hand spreader or broadcast spreader to cast the seeds across a wider area if there are several areas to spot seed. Otherwise, spreading by hand will do just fine. Type of seed is often dictated by the amount of traffic your lawn sees, exposure to sun, current turf composition, as well as preference. In this example, we used a Kentucky Bluegrass blend from a local nursery due to its durability and deep green color. 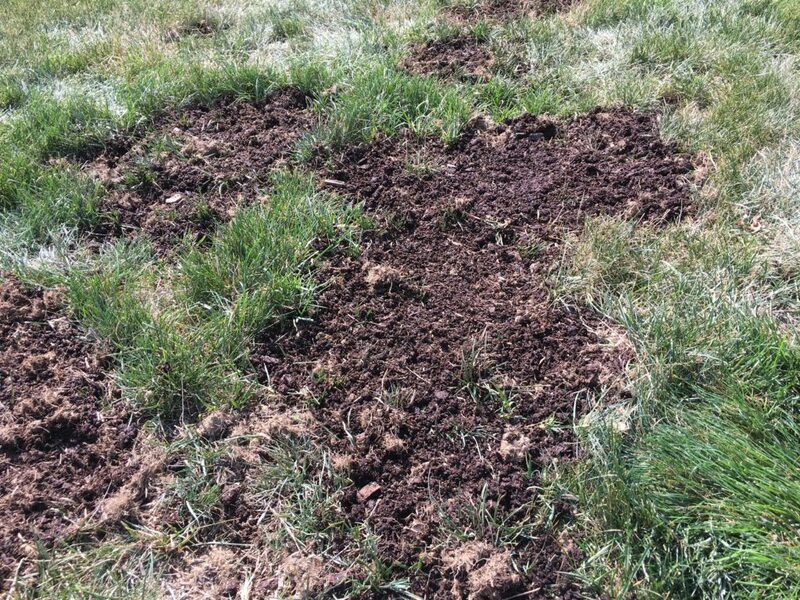 Crumble and cover a layer of Sweet Peet (about ¼”) overtop the newly planted grass seed. This will help ensure the seed stays put and stays moist. This will also lessen the amount of watering necessary for the seeds to take root. Set a broadcast or drop spreader to the appropriate settings and apply 24-25-4 starter fertilizer to the newly seeded area. This will ensure the seedlings are off to a strong start. This is the key! 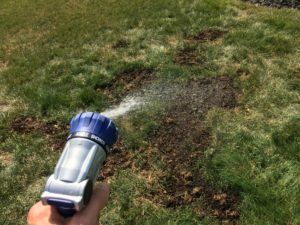 Water spot seeded areas lightly to ensure the areas stays moist. Sweet Peet is excellent at retaining moisture so you won’t need to water as much as you would with other lawn repair products. Water lightly once to twice a day, more if seeding full sun areas. This is just 10 days after spot seeding with Sweet Peet!